(L to R) Pauline Thomas (Neighborhood Watch); Melitta Duncan (AV Animal Services); Mitch Toles (Neighborhood Watch) ; Gil Barajas & Cisco (Neighborhood Watch). 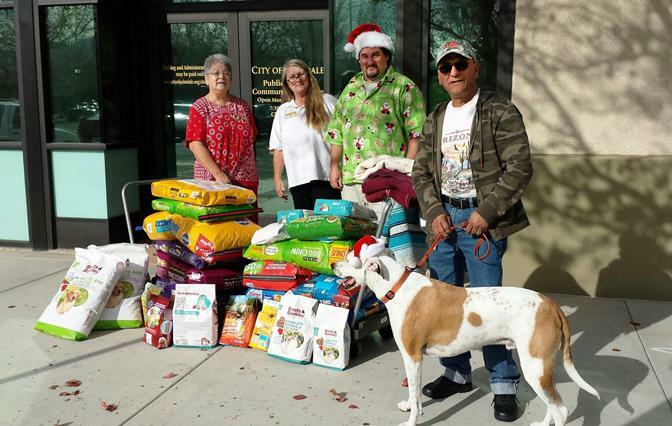 PALMDALE – The City of Palmdale and several of its Neighborhood Watch groups partnered to collect and donate more than 600 pounds of pet food, along with dog houses and bedding to Antelope Valley Animal Services (AVAS). AVAS works to strengthen the bond between pets and their families. Their programs are designed to help reduce unwanted litters and promote pet health and responsible custodianship. They also assist the animals that live on the streets and in the desert by providing rehabilitation and socialization so they may find a forever home. Donations are needed throughout the year as are volunteers. For more information contact Antelope Valley Animal Services at avanimalservices.org or 877-5125-pet 1-877-512-5738. 3 comments for "Neighborhood Watch groups partner to help AV Animal Services"
Very nice story. Woof, meow, & Merry Christmas! What a great thing! I wish I had neighbors & a neighborhood like this! The majority of my neighbors don’t speak to ANY of the other neighbors & are just flat out unfriendly. They pretend they don’t see you if you wave ‘hi’ . So much for being near Lane Ranch & a friendly neighborhood.